Redwing 40 Hybrid is a new version of a very successful series of designs that are economical to build and operate without giving up on accommodations and simple comforts. The Redwing 40 Hybrid is very capable for coastal cruising, ICW, canals, backwater cruising, and island hopping. Her 3’-6” keel draft and 12’-0” air draft are excellent for ICW and canal cruises. She has 280 gal of fuel and over 1000 nmi range. Below, there is a Vee berth forward with head and shower for occasional guests or family who may want to visit for an overnight or crew for all or part of a passage. The galley and settee are up in the pilothouse so the cook and crew can enjoy the 360 degree view while at anchor or underway. In the aft cabin, the office will be useful to keep track of ships business and other affairs that might be required while underway for long periods. There is a double berth in the aft cabin. . The Redwing 40 Hybrid’s heart is the new Styer M094-84, 75 hp diesel with a 7 kW pancake motor/generator located between the engine and gear. In this configuration, the hybrid can be used as a generator to recharge battery banks in generator mode and silent electric propulsion as a motor. The Redwing 40 Hybrid’s long LWL, light D/L, fine entry and gradual run produces a very efficient hull. Her low slung hull and house offers little wind resistance. Fuel consumption is 2 gph at hull speed of 8 knots and approximately half power. As with all new technologies, many of the advantages haven’t even been fully imagined. Here are a few more reasons to have the hybrid onboard. Hand held remote operation under electric power. There are many possibilities for improvement over yelling from the pilothouse. No need for an additional genset (AC or DC) taking up space, weight and cost. Save fuel while transiting locks in canal systems under electric power. Battery charging is done underway when the engine is operating at its most efficient power range. Overall fuel economies are produced from the total system utilization. Get-home capability built in this hybrid power system. Smell the roses and hear the birds while underway in scenic waterways. Imagine getting underway in the morning calm under total silence, not disturbing the egrets and heron along the shoreline near by. Solar panels on the pilothouse top complete the energy efficient approach. While current solar panels aren’t efficient for primary propulsion for boats of this size and the sun only offers a relatively small window of peak charging hours, solar recharge will supplement overall power usage. The Redwing 40 Hybrid’s panel construction is suitable for most any material including steel, aluminum, wood epoxy or composite. Her box keel construction is very strong in the (likely) event of grounding. Frames and panels may be computer (CNC) cut for easy one off assembly or limited production runs. We all ask, what can we do to make a difference for energy independence, efficiency and low carbon foot print? Will new owners be forward thinking and embrace new technology and synergistic economies? Is a Redwing 40 Hybrid the boat of their future? Is there another choice? You be the Judge. 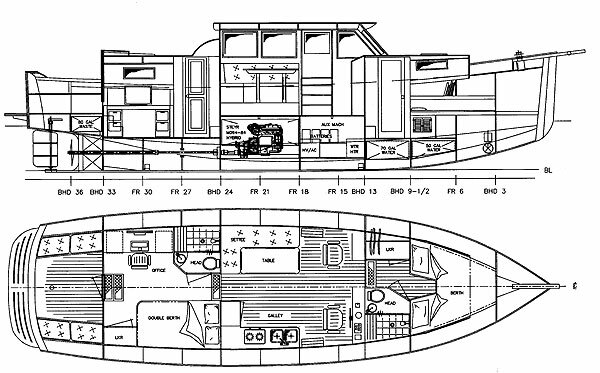 Purchase and Download Study Plans for the REDWING 40 HYBRID for $5.00 in PDF format (zipped file). 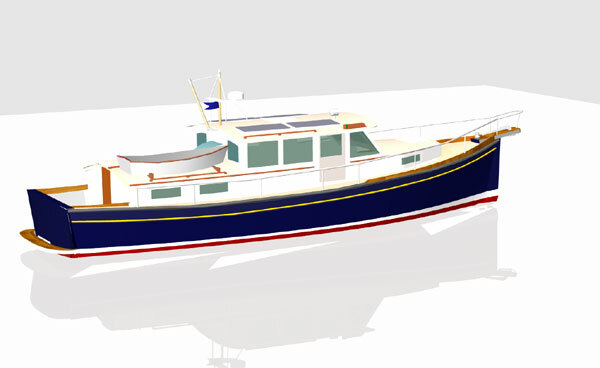 Purchase Construction Plans for the REDWING 40 HYBRID for $2100.00 for delivery by US Postal Service.